The Steamboat Bertrand Museum « The Turner Brigade--Missouri Volunteers, U.S.
How often we wish we could travel back in time to the Civil War to see how things REALLY were. That is still not possible; however, veritable time capsules were sunk before during and after the war that give us a peek into the past as they are exhumed. Most of us are familiar with one such peek back in time in the form of the Steamboat Arabia. This summer my family had the privilege of visiting the steamboat Bertrand. Together they stand as bookends of the Civil War. Both boats were traveling up the Missouri with passengers and goods for trade in towns up river. The Arabia was sunk in September of 1856; the Bertrand was sunk in April of 1865. From the moment you enter the museum of the Bertrand, you know the big difference in the two different times. The Bertrand carried a howitzer and its ammunition as well as rifles and Maynard cartridges. The war was on, and even in the West where battles of the Civil War were absent, the need for arms was evidently top priority. The men in my party were eager to examine the box of spherical case, the boxes of friction primers and other such goods. I moved on to goods very much like those displayed in the museum of the Arabia: ironstone dishes, glasses, food in jars and tin cans, combs of both wood and rubber, lamps, washtubs, waffle irons, tools of all types, sewing supplies, clothes and personal items of the passengers. I loved seeing all these things and noting things like: the soup tureen I have is almost exactly like the one in the museum except mine is round and theirs is oval. Studying items in museums like this help me to know what the people were really using and to recognize it when I see one like it. There were very few clothes on display compared to those in the Arabia. 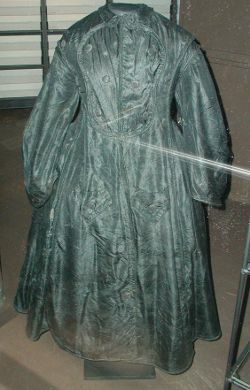 This black silk ladies’ coat belonged to one of the teen-aged Campbell sisters traveling to join their family. The Bertrand carried a large variety of ironstone, including these serving pieces and place settings. They have a wonderful computer tour of the museum that operates with a touch screen format. When you want to see an item up close or learn more about an item, you just touch, and the information is given. Randy and Bill were using this program as Kit and I wandered on to the Nature part of the museum. The museum is part of the DeSoto National Wildlife Refuge run by the U.S. Fish and Wildlife Service. It is an architectural gem. Multilevel walkways in the museum are almost over the river and allow you to view the birds, turtles, and other animals from climate-controlled comfort and convenience. I moved on to the small gift shop and then asked the attendant if tours of the enclosed shelves could be arranged for small groups, since I wanted to see the clothing beneath those labels. 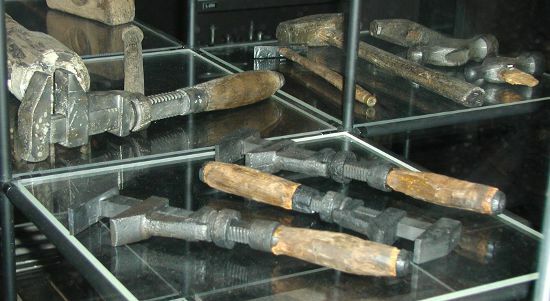 Large quantities of tools, like these monkey wrenches, were being shipped to stores upriver. Immediately she picked up a phone and called Jennifer to come and talk to me. Randy was sent for just as quickly. The most amazing part of our visit happened next. Jennifer took us back to the library where she gave Randy all the records on the conservation of the howitzer artillery boxes to read, and then she copied it for him. While he was doing that, the rest of us explored the library and examined the reproductions a graduate student had made. Yes, tours may be arranged. I do have a list of all the items in the collection, which Jennifer e-mailed to me. The people at this museum were the nicest, most helpful people you could imagine. I highly recommend you visit the Bertrand. 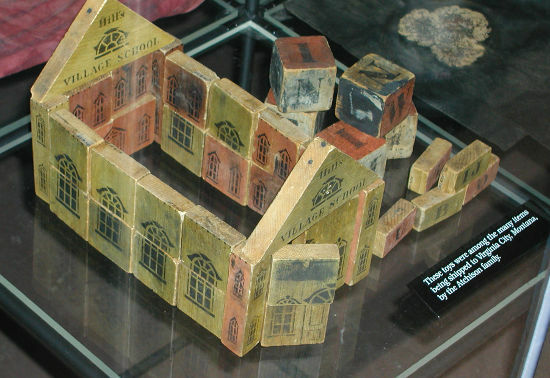 These toy blocks belonged to a young passenger. We ended our visit with a brief drive and walk to the site of the sinking, now in Nebraska but on the east side of the Missouri. The boat is covered with water and no longer visible, but marked with buoys. The Bertrand is located in the DeSoto National Wildlife Refuge, in Missouri Valley, Iowa. This is about four hours north of Kansas City across from Omaha, NE. This article was originally published in the September 2002 issue of The Shrapnel, the newsletter of the Turner Brigade. For information about The Shrapnel, contact Capt. Randy Baehr, Editor.